UAE: Emirates' Destination and Leisure Management (D&LM) Division is embarking on a major expansion of its Dubai headquarters, as demand surges from business and leisure travellers flocking to Dubai, and the division looks to develop luxury hotels in key overseas destinations to enhance Emirates' international presence. NEW headquarters: The new expanded Dubai headquarters of The Emirates Group’s Destination and Leisure Management Division will house more than 1,000 staff of Emirates Holidays, Arabian Adventures, Congress Solutions Dubai and Emirates Hotels and Resorts. A new 10-storey extension to the four-storied Emirates Holidays headquarters on Sheikh Zayed Road will create an office complex housing more than 1,000 staff of the division's four specialised operations. 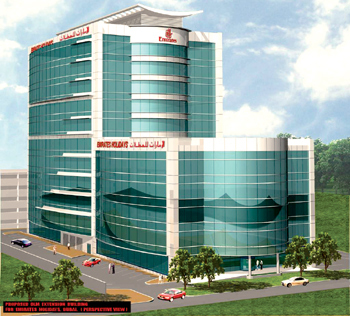 The new division headquarters, to be built at a cost of Dhs 80 Million, (US$ 21.8 million) brings the total investment of Emirates' D&LM Division in new property projects over the next four years to Dhs 2.4 billion (US$ 652 million). This includes the 77-storied twin tower Emirates Park Towers hotel complex, and Emirates Marina Serviced Apartments & Spa. In total, Emirates Group has invested Dhs 3.3 billion (US$ 899 million) in Dubai property projects, including the new Emirates Group Headquarters complex, Emirates Engineering Centre, Emirates Crew Training College and Dnata Cargo's Freezone Logistics Centre extension. Emirates Holidays' retail outlet Emirates Holidays World, housed on the ground floor of the existing building, is also currently undergoing a refurbishment programme designed to enhance the holiday booking experience for its customers. The design of the new building complements the exterior of the existing Emirates Holidays headquarters, and will comply with European Union construction and environmental standards. Work will commence during June, with a scheduled 14-month completion date.